Manufacturer of a wide range of products which include abrasive cutting machine. We are the leading organization and successfully engaged in providing Abrasive Cutting Machine. This cutting machine range is developed from the finest quality components in line with the market norms under the direction of our experts. 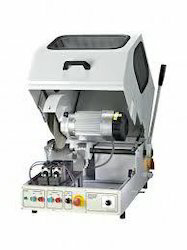 The offered cutting machine is provided in diverse specifications as per the requirements of customers. Offered cutting machine is inspected in terms of quality before delivering in the market.